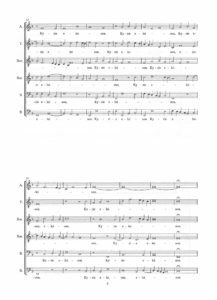 A welcome trend in the performance of Renaissance polyphony in our own times is surely the manner in which historically informed approaches to and practical realisations of the music have begun to merge. They never were mutually exclusive in the first place. We have gained, too, a sense of critical distance from the incredible revival of early music that began almost half a century ago. Choral directors no longer necessarily face the choice between a ‘scholarly edition’ and a ‘performing edition’ of particular works. That gainsaid, some differences between the various printed versions are bound to remain. 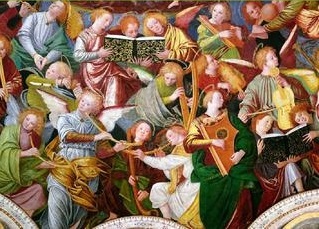 Most recent musicological research confirms that singers’ training in the Renaissance must have differed largely to vocal studies in the present day. It is clear that a choir in those days would have sounded radically different to a modern one. 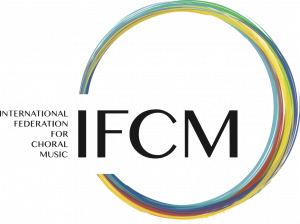 But if we think that it is an easy task to duplicate original performing conditions and that the ‘true character of the music’ will be immediately revealed only when we come close to ‘what the composer imagined’, we will, as choral directors and singers, face immense frustration for a number of reasons. By its very nature, Renaissance polyphony demands a special kind of precision from the singer. The days are long gone when the standard way of performing polyphonic vocal music was with a fulsome vibrato. And we must take on board the pioneering work carried out by many early music ensembles, e.g. The Tallis Scholars, which were founded in 1973. Polyphonic music of the Renaissance is just so full of detail, and unless a sense of clarity is inculcated in the singers, this will not be heard. Vibrato is not our enemy, and a moderate use may be indicated for certain repertoires. If, however, it is too hefty and no longer merely modulating the timbre, the vocal lines will surely become muddy and any detail obscured. He is not sparing either in his criticism of English choirs in the larger churches the present author notes, and proffers a slightly snide term, the “cathedral hoot”. Members of the small, specialised ensemble employing one singer to a part, or perhaps two at the most when a small section of unbroken voices or girls’ voices takes the upper voice in five-voice music and the two upper voices in six-part works, might well be advised at this point not to read on, my aim here being to offer to larger mixed voice choirs some practical advice on how to solve some thorny issues discussed below. Palestrina, Missa Papæ Marcelli, Kyrie I. Edition by Lewis Jones held by the Choral Public Domain Library. Transposed down a perfect fifth according to the chiavette principle. “The significance of the chiavette has raised considerable controversy among musicologists”, adding that earlier theories seem to be without historical foundation and claiming that “the clefs were moved mainly in order to avoid the use of ledger lines”. Palestrina, Missa Papæ Marcelli, Kyrie I. Edition by David Fraser held by the Choral Public Domain Library. Music not transposed, remaining at ‘visual pitch’. As late as the 19th century, universally recognized pitch standards did not exist. What was used in one part of Europe varied greatly from traditions maintained in another. There is even evidence that it varied from one city to another within a single country or limited geographical area, with the same music being rendered at entirely different pitches. Generally speaking, in the Baroque Era, pitch levels ranged as high as A=465 (in 17th century Venice), and as low as A=392 (in 18th century France). Thankfully, it is possible to generalise a little: pitch was high in North Germany and lower in South Germany, it was low in Rome but high in Venice, and pitch in France depended on whether chamber music, opera or sacred music was being performed. Whether one opts for a transposition down by a fourth, or up by a minor (sic) third – to take two common solutions applicable to a vast body of the choral repertoire – the director is still confronted by the fact that late Renaissance and early Baroque pitch lies almost a semitone lower, with A=415 not 440. This conflation puts paid to any claim of academic propriety. So, let us assume that choir directors today should assemble a group of the correct size, with an ‘authentic’ distribution of voice parts, and having taken to heart the conclusions by musicologists about performing pitch, and even after having rationalized the lack of castrati, they will still be confronted with the well-nigh insoluble problem of discovering or imagining how singers in the 15th and 16th centuries actually produced their voices. We simply have to admit that singers are at an immense disadvantage when attempting to recover lost techniques. They are confined to reading descriptions of singers and of singing. Instrumentalists at least have the physical objects in their hands, can examine built-in clues and readily learn about limitations. A voice described as ‘sweet-sounding’ in the 16th century will probably not correspond to what we think of as sweet. And which, in any case, are the appropriate adjectives to describe the voice of any given living singer? Our opinions are strongly subjective, and we can only guess as to what earlier writers meant. Nobody has yet built a time machine, and there exists no certainty as to the veracity of our conjectures. The modern names of ‘soprano’, ‘alto’, ‘tenor’ and ‘bass’ meant either precious little or entirely different things in the 16th century. To us they are highly characteristic of four particular voice types. They relate in general terms to the older names as follows: ‘S’ = cantus, a falsettist or castrato; ‘A’ = altus, a high tenor; ‘T’ = tenor, our Tenor II today, or a high baritone; and finally ‘B’ = bassus, a ‘true’ bass, with a range extending down to D or even C at times. Any perceived unwillingness by a modern choir director to accept this historical state of affairs is usually caused by a confrontation with a mixed voice choir that is a jack of all trades but master of none. This SATB group has, for better or worse, become the norm. Several approaches on how such an ensemble can best sing polyphony of the high Renaissance – where ‘normal’ vocal scoring started with music in five parts and extended to works in 19 voices – have been drawn up over the years; some, like the curate’s egg, are good in parts. The objection to women singing tenor is based on evidence that many, if not most, females cast in this role were not taught how to use properly the other registers of their voice. If the singers were young enough, they could, one supposes, be retrained to allow the mid-range to be the range they considered ‘normal’. But the issue of time management and the ensuing emotional upheaval within a choir certainly outweigh the benefits. It is not fair to demand that women ‘do’ this to their voices. As for the possibility of ‘training up’ the high tenors in a mixed voice choir to sing falsetto where needed, there surely are not the resources – in terms of time and effort – to make this a viable alternative. Moreover, the issue of vocal health arises again: mature voices will be subjected to stress and strain and tenors in school choirs and youth choirs will be pushed in a direction not necessarily beneficial to any subsequent vocal career. Another big issue concerns the vocal range and the tessitura demonstrated by each voice in a polyphonic texture. In a typical Renaissance work in five parts, a single voice part usually extends over an octave and a fourth. Soprano I and Soprano II will often go from d‘ to g”, the Alto from, say, c‘ to f”, the Tenor from g to c”, and the Bass from G to c‘. The real problem, as ever, is the second or third voice down. It seems singers in those days were simply able to ‘do different things’ with their voices. 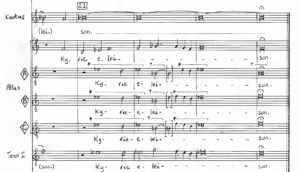 As a composer, it is clear to me that the ‘ideal’ five-part scoring for a modern choir is SSATB or SAATB, i.e. three women’s voices and but two men’s. In much Renaissance music the result – if most of the scholarly editions are anything to go by – is usually SATTB or SATBarB, an inversion of this ‘best’ distribution. 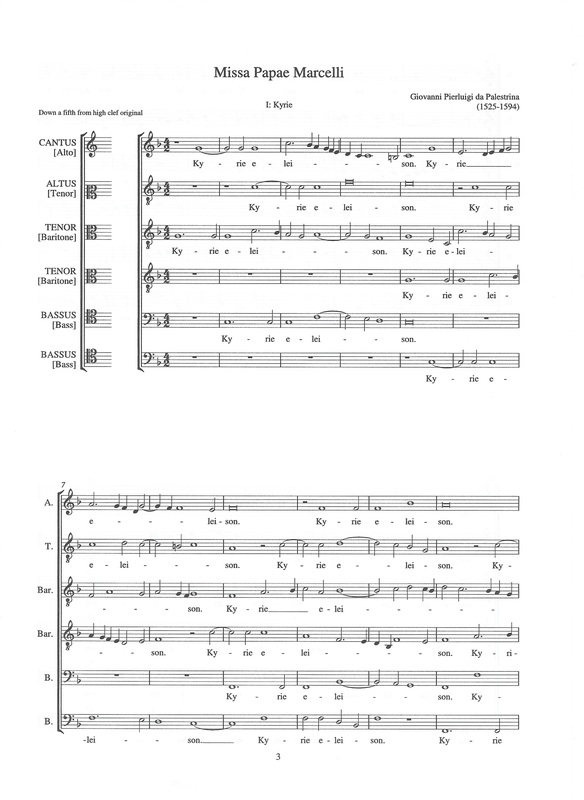 In six-part music composed in our own times, I am convinced that most choirs would welcome SSATBB or SSATTB, if not SSAATB, this latter voicing must be understood not as a situation in extremis, but as a pragmatic acceptance of the sound so many choirs in the 21st century can best attain. Renaissance works in six parts usually end up, in terms of their vocal scoring, as SATTBB, exactly that which the choir director least wishes. 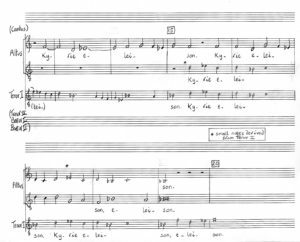 Be all of this as it may, the conductor of an ‘average’ mixed voice choir – whatever that might be – is confronted with the task of either choosing a performing edition with transpositions that are effective for the ensemble and the task at hand, or making his or her own editions. On many an occasion, one’s hands are well and truly tied: a cornucopia of polyphonic settings will work in but one particular transposition: the soprano voice will go as high as g” and the bass part as low as F. These notes act as effective limits for a contemporary choir. Sometimes there is a modicum of room for manoeuvre, and the overall range of a score is a whole tone less, allowing Hobson’s choice: the Soprano extends to g” and Bass goes down to G, or the Soprano rises to an f” and the Bass reaches low F.
The problem, as ever, concerns the inner voices. This is the crux of the matter. Whatever a conductor or editor/arranger decides as the best transposition and scoring, the second or third voice down in a five-voice texture will not only use a range of an octave and a fourth, but either, in its tessitura, venture uncomfortably low and linger there awhile, or stray adventurously high, only stubbornly to remain there. To take an invented but not fictitious example: an ‘alto’ line that ranges from g to c” or a to d”. Up to now, I have not discussed the idea of using countertenors. A true countertenor is a rara avis indeed, and the choir lucky enough to have some – assuming they have not already been poached by a specialist vocal ensemble – is in an unusual position of strength. This voice part covers naturally the problematic range just mentioned. It is the only vocal solution. Period. It also does not help most choir directors, as they generally will not have these voices at their disposal. Now that we have effectively excluded both the use of women singing tenor lines in their boots – a ‘baritonal’, to coin a term, and in my mind and ear quite unpleasant sound, – and men crooning away in falsetto in a forlorn attempt to manage a countertenor line, I would like to put forward an innovative but perhaps not really radical solution: the re-composition of these lines, in order to arrange five-voice music that needs six voice parts, and six-voice music that requires seven or even more. This amounts to a minimal invasive method, as a cosmetic surgeon might put it. 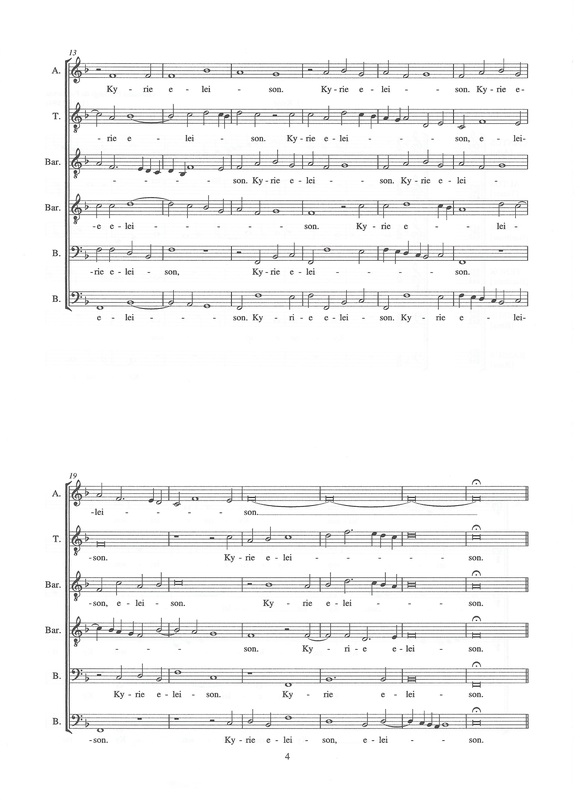 My idea is to simply rescore, say, an alto part in an SSATB texture for two discrete voices in the choir: thus, ‘A’ produces two parts, ‘A’ and T I’, the original ‘T’ now becoming ‘T II’. 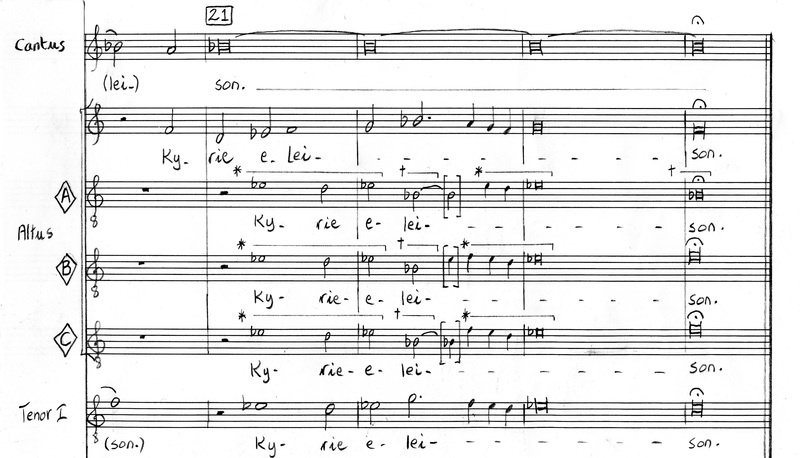 With a little jiggery-pokery, and going ‘beyond the notes’, it is usually possible to fix the ‘new’ voices so that they take part in the polyphony in a meaningful way and do not stop abruptly halfway through a line. Occasionally they can simply ‘rove’ and mesh in to an already existing part, a ‘T II’ voice homing in on the bass voice and even joining it for a few notes. Cadences must be observed of course: it would be strange if some members of the chorus were not to take part at such key points in the score; and at the end of the entire work, it is also necessary that all singers are actually ‘doing something’. In practical terms, what this means is that an inner voice that goes too high even for the high tenors who originally started out with it, is passed to the previously tacet low altos, who continue for as long as the line remains capable of being sung. The new tenor line, as noted above, can not simply stop, but must be recomposed so as to merge with, say, the bass, and thus arrive at a fitting cadential point. It is vital that no new notes appear in the harmony, the aim being to ‘poach’ notes from neighbouring parts. If there appears no way out of melodic dilemma, a pitch not otherwise present in the harmonic structure may be introduced, but this shall perforce be limited to doubling at the octave. The aural result will not be picked up by many an audience and surely will not disturb a highly discerning one. Choir directors have busy lives, and are usually not trained composers. But I am certain that the vast majority, given the chance and an HB pencil, will be capable of distributing a single inner voice between two vocal parts in such a way that: the music continues to make sense, the singers use the best part of their range, and nobody listening is even aware of the fact that five-part music has been rescored for six voice parts, and six-voice works for what are effectively seven or eight vocal lines. I trust that the examples below will give ample evidence of the benefits of this approach. The moment the singers in a modern mixed voice choir open the music and start to sing, many a compromise will already have been made. Choir directors will have chosen a Renaissance work that was originally sung either with just male voices, or with trebles taking the highest part or top two lines. Either way, countertenors would have been part of the proceedings – be it as the upper voices in the former case, or the inner ones in the latter, assuming, say, we are dealing here with polyphony in six real parts and upwards. The problems of pitch, clefs, vocal scoring, range and tessitura have all been discussed in detail, above. We concluded that a new approach is needed. The work I have chosen for this experiment (and this may come as no surprise) is the Missa Papæ Marcelli, by Palestrina. There are two reliable editions held by the Choral Public Domain Library (www.cpdl.org), and these are in stark contrast to each other. In the first, the editor, Lewis Jones, has assumed chiavette, and transposed, rightly or wrongly, the music down a perfect fifth. The result is an ATBarBarBB scoring. Clearly, this can only be sung convincingly today by a male voice ensemble. There is nothing wrong with that. 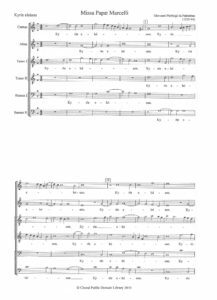 In the second version, edited by David Fraser, the music has been transcribed at original ‘visual pitch’; the result is a score calling for SATTBB forces, although the two ‘T’ parts are only nominally tenor lines, considering their range and tessitura. The actual visual ranges of the six voices in the chiavette scoring are as follows: Cantus = g-c”, Altus = c-f’, Tenor I = B flat-d’, Tenor II = B flat-d’, Bassus I = F-g, Bassus II = F-g. In the ‘original’ scoring these are: Cantus = d’-g”, Altus = g-c”, Tenor I = f-a’, Tenor II = f-a’, Bassus I = c-d’, Bassus II = c-d’. Even a cursory glance at this latter version reveals some musical difficulties. The bass part goes no lower than c, and extends as high as d’, not a happy sing as it were for many men. (I used to hate parts like that as a student.) My intuitive reaction is transpose this version down a minor third, giving the bass a range from A-b, but this causes problems with the soprano range, which would then become b-e”. Although there is nothing wrong with high e” as a top note; it could be quite bright, with good use of the mask. There is no reason why every piece sung in a programme must extend de rigueur to g” in the soprano. 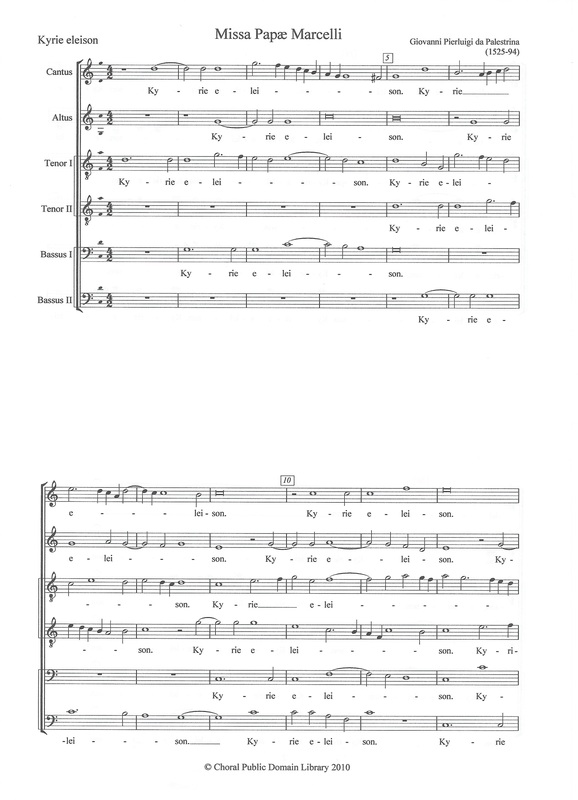 Palestrina, Missa Papæ Marcelli, Kyrie I, bars 14-19. Altus recomposed as two discrete voices: ‘A I’ and ‘T II’ in a modern transcription. Music transposed down a tone from ‘visual pitch’. Original Tenor I notated as small notes for reference. Upper voice of the two ‘new’ voices notated in small notes where it has ‘roamed’ to original Tenor I and is in unison with this part, in normal notes where it takes original Altus line. Lower voice of the two ‘new’ voices notated in small notes where it has entered with original Tenor I and is in unison with this part, in normal notes where it has ‘roamed’ to the original Altus line. Perhaps, then, a transposition down by a whole tone is best. The entire setting of this mass now admits an overall vocal compass extending from B flat in the bass to f” in the soprano. A music director must choose the best key – to use a modern term – in which to sing the music. A high key will produce a performance that is brilliant and dramatic, an interpretation favoured by some scholars, whereas a low key will engender a sense of reverence, a more fitting rendition of the music other musicologists would maintain. With a new key signature of two flats (the music down a tone) as opposed to three sharps (the music down a minor third) the score looks quite benign. The basses, let us note, now have a range B flat–c’, and no longer need to work at getting from c’ to d’ cleanly, this being the moment where chest voices runs over into head voice, much like the somewhat higher passagio that all tenors have to conquer. Let us now turn to the inner voices, ‘T I’ and ‘T II’, both of which now extend from e flat to g’. A good choir with some real tenors, not high baritones, will now be able to tackle one if not both of these parts. (Specialist Bach choirs will no doubt manage the ‘original’, with no need for further downward transposition and the tenors’ range remaining f-a’.) 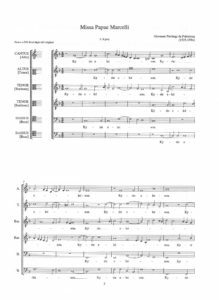 A less able choir should be able to mix the timbres of alto and tenor in these two tenor voices; the tone downwards transposition alleviates the need – one hopes – for falsetto singing by the tenors, even if the large range belies prima vista a high tessitura. The voice I would actually like to recompose is, of course, the second one down: Altus, in the original MS. Whether one stays with Fraser’s transcription, the pitch of which is the ‘visual’ one, or sings this down a whole tone, the part remains a beast – g-c’ or f-b’ flat. It just can not be sung adequately by the altos, and nor by the tenors. I would opt strongly for transposition down a whole tone. And I would then distribute the voice in two discrete parts. Using modern clefs, the higher passages in this alto part remain ‘A’, whilst the lower ones become ‘T I’. There is a knock-on effect: one could now consider notating ‘T I’ and ‘T II’ as baritone parts, in bass clefs, even if this produces more extra ledger lines than when reading in tenor clefs. Also, the highest voice – Cantus in the original and soprano in a modern transcription – has a not unproblematic range: from c’ to f”, and this could well be recast as two discrete parts, ‘S’ and either ‘A I ’ or ‘MSop’. Thus, the six-voice texture could appear on the page as music for seven, eight or even nine voices. As ever, the proof of the pudding is in the eating, as Cervantes put it in Don Quixote. The CDPL website offers both Sibelius and Finale files, presumably for download, and these could surely form the basis for a choral director’s new bespoke version. And volunteers should step forward now. 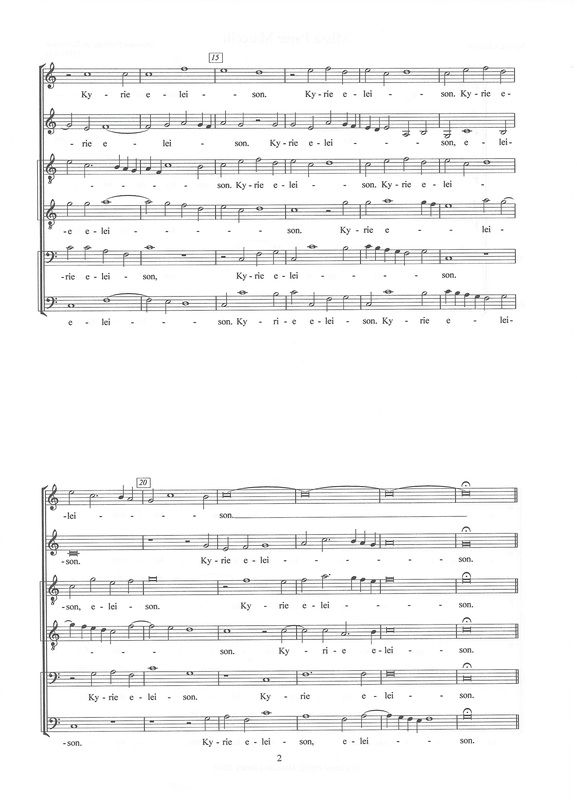 Palestrina, Missa Papæ Marcelli, Kyrie I, bars 21-24. Altus recomposed as two discrete voices: ‘A I’ and ‘T II’ in a modern transcription. 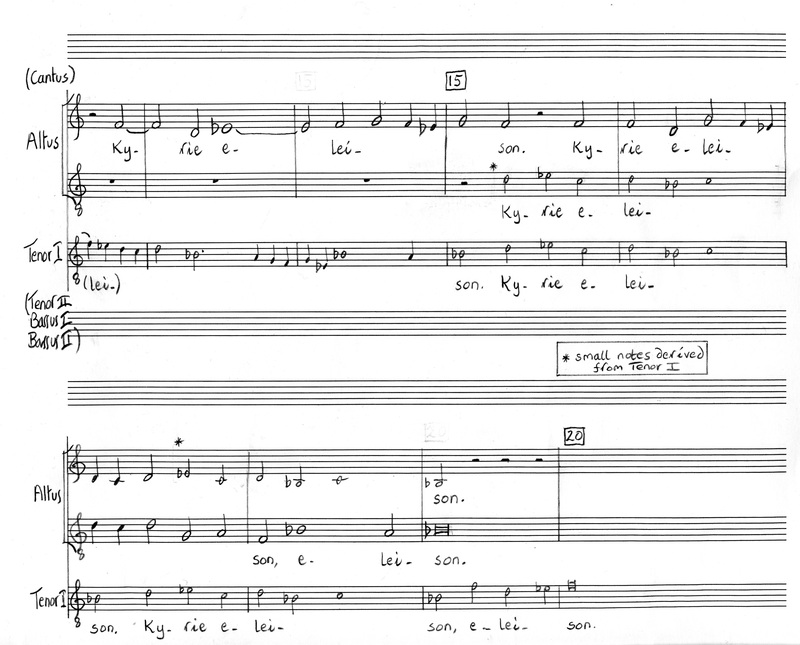 The ‘new’ lower voice offered in three variants, A, B and C. Original Cantus, Tenor I, Tenor II, Bassus I and Bassus II included to complete full score. Upper voice of the two ‘new’ voices notated in normal notes because it takes only original Altus line. Lower voice of the two ‘new’ voices notated in small notes where it has entered with original Tenor I, ‘roamed’ to original Tenor II, moved back to original Tenor I and ‘roamed’ again to Tenor II at the cadence (version A); notated in normal notes where it has entered with original Tenor I, ‘roamed’ to original Tenor II, moved back to original Tenor I and finally joined the original Altus at the cadence (versions B and C). Hugh Benham, Latin Church Music in England, Barrie & Jenkins, London, 1977, p. 31. Howard Mayer Brown, ‘Choral Music in the Renaissance’, Early Music, Vol. 6, No. 2, (April 1978), Oxford University Press, p. 166. The latter word denoting clefs, not key signatures in the modern sense. Gustave Reese, Music in the Renaissance, J. M. Dent & Sons, London, 1954, p. 531. Willi Apel, The Harvard Dictionary of Music, Heinemann, London, 1969, 2nd. ed., p. 149. Jeffrey G. Kurtzman, ‘Tones, Modes, Clefs and Pitch in Roman Cyclic Magnificats of the 16th Century’, in Early Music, 1 November 1994, p.7. Herbert Myers, ‘Pitch and transposition’, in A Performer’s Guide to Renaissance Music, Jeffery T. Kite-Powell, (Ed. ), Indiana University Press, IN, USA, 2007, 2nd ed., p. 299. 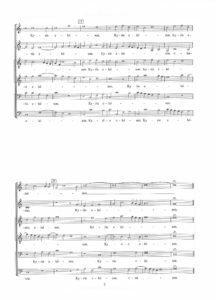 Roger Bowers, ‘The Vocal Scoring, Choral Balance and Performing Pitch of Latin Church Music in England, c. 1500-58’, Journal of the Royal Musical Association, Vol. 112, No. 1, p. 9. John Caldwell, ‘The pitch of early Tudor organ music’, in Music and Letters, Vol. 51, No. 2, April 1970, p. 156. The motet O bone Jesu by Robert Carver (ca. 1485–ca. 1570) is contained in the Carver Choirbook, MS Adv. 5.1.15. Music Program Chair, Choral Director, Des Moines Area Community College, Ankeny, Iowa. In discussion with the author. Le Istitutioni harmoniche (1558). A useful edition is The Art of Counterpoint, Part Three of ‘Le Istitutioni harmoniche’, Guy A. Marco and Claude V. Palisca (trans. ), Norton, New York, 1976. The ‘SSA’ might just as well be ‘SAA’, but this is not the point and quite academic at this stage. An obscure term, possibly rooted in early Silesian.